Top quality fitted sheets from Connie Home Collection. Available in linen and Egyptian cotton to coordinate with your favourite Connie design. Select your desired size of fitted sheet and follow the bed size chart to choose the appropriate fitted sheet for your bed size. All the Connie fitted sheets have elastic corners to tuck under standard depth mattresses. 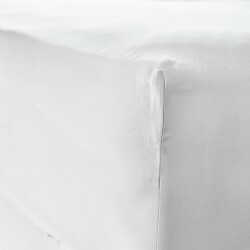 Soft and smooth luxurious fitted sheets with adjustable, elasticated corners designed to fit perfectly to your mattress. These sheets are hypoallergenic and therefore ideal for all skin types. Particularly the Atlanta linen range of fitted sheets which have properties that are breathable and absorb the humidity in the air. Their 100% natural fabric makes these sheets the perfect choice to avoid allergies. There’s nothing more comfortable at bedtime than having a cotton or linen fitted sheet which adapts to your body temperature, keeping you fresh in the summer and warm in the winter. Each of our fitted sheet ranges is pure white, either cotton or linen and gives your bedroom a luxurious yet simple appearance. The other benefit of high quality fitted sheets is they maintain their soft feel and strength even after many washes. Available across a range of sizes, single, double, king and super king, for you to choose from; depending upon the size of your mattress. The Provence fitted sheets are soft and smooth made from Egyptian cotton with a high 500 thread count. The pure white sheets stand out for their ability to retain a rich smoothness despite multiple washes throughout the years. Made from only the highest quality, 100% natural Egyptian cotton they are the best material to have against your skin. The smooth texture is perfect for customers looking for a luxurious feel to their bedding. Adjustable sheets with elasticated corners to adapt to the size of your mattress and allow for easy fitting, as well as comfortable night’s sleep. Noted for their high quality Egyptian cotton, the Lisbon range of fitted sheets, like other luxury bedding brands uses this prestigious material. These fitted sheets are made from this luxurious cotton and woven to a soft 300 threads per inch. The result is a natural and hypoallergenic sheet perfect for all skin types. The pure white colour of the Lisbon fitted sheets generates a pure and bright effect to each component of your bed linen. With elastic corners the fitted sheets fit snuggly to your mattress and contribute towards a refreshing and relaxing sleep. With various size to choose from the fitted sheets from the Lisbon range are a great choice for all bed sizes. The sheets are deep and allow for a maximum mattress depth of 25cm. The smooth touch of the Connie Home Harmony fitted sheet may surprise you as it increases your chances of enjoying a great night’s sleep. It is crucial at bed time that we employ the best quality of bed sheets possible. The Harmony range of luxury Egyptian cotton fitted sheets will not disappoint you with it’s high 300 thread count. Following the format of all our fitted sheets the Harmony has elasticated corners designed to provide the perfect fit for your mattress. This type of elasticity means it is extremely easy to make the bed, particularly compared to the classic hospital style of bottom sheet. The pure white fitted sheets, with no decorative edging, are the ideal solution to match the traditional white of the Harmony collection of bed linen which has an attractive dark blue raised piping around each edge. The Victoria fitted sheet is adjustable with elastic corners. Made from Egyptian cotton with a 300 thread count which creates a fitted sheet extremely soft and smooth; helping you to benefit from a relaxing sleep at bedtime. Being made from 100% vegetable fibres this makes the sheets easy to maintain. Durable enough to last for many years despite frequent washing. The pure white colour which has a satin touch giving the fitted sheet a bright, luminous effect. This contributes to creating a stylish look to your bed linen. Available across a range of measurements to adapt to the requirements of UK bed mattresses. When you are looking for quality and comfort in your bed linen, then there is nothing better than our Atlanta linen fitted sheet. Made from 100% natural washed linen, this helps to make your relaxing moments even more enjoyable. The linen fitted sheets from the Atlanta collection have the enviable ability to adapt to all seasons. They remain cool in the summer months and keep you warm during the winter; making them ideal for all year round usage. With a generous 25cm depth, the fitted sheet is available in a range of sizes appropriate for the bed sizes found in the UK; from single, double, king and through to super king size.